San Bernardino County, California San Bernardino County, California U-Pick farms: Find a pick your own farm near you in San Bernardino County, California for fruit, vegetables, pumpkins, organic foods,local produce and more! 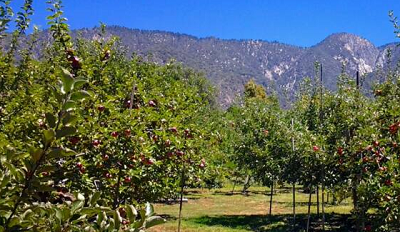 Looking for a local, pick-your-own farm in San Bernardino County, California? Scroll down this page and you will see the U-Pick farms in San Bernardino County, California, sorted by county. Those that offer organic or sustainably grown produce are identified by the words "organic" and/or "sustainable" in Green, next to their name (see "What does Organic mean?"). The U-pick crops they offer follow the name of the farm. To search the page for a specific crop, use Ctrl-F (or on an ipad or Mac, use their "search on this page" function) If they have a website, the name will be in blue and underlined; click on it and it will open their website. If you find anything outdated or inaccurate, see the customer and farmer menus (as appropriate) at the top menu bar to submit updates and corrections and help me keep each current! 10133 Ward Way, Mentone, CA 92359. Phone: (909) 794-7653. Email: [email protected]. Open: Everyday 9 am to 6 pm. Click here for current open hours, days and dates. Directions: From I-10 in Redlands Take university off ramp go left to Lugonia right to Ward Wy. about 4 miles go right on Ward Wy. Click here for a map and directions. We minimize use of pesticides and other chemicals. Payment: Cash, Check. Click here for our Facebook page. We are located nearRedlands, Yucaipa, Riverside,Banning and Beaumont CA. We have Christmas trees, too. 32335 Live Oak Canyon Road, Redlands, CA 92373. Phone: 909-795-8733. Email: [email protected]. Open: September 19 am to October 1 From 9am to 6pm, October 2 pm to October 30 From 9am to 9pm, October 31 9am to 6pm. Click here for current open hours, days and dates. Picking updates: Click here for picking updates. Directions: Located just off Interstate 10 at Live Oak Canyon Road /Oak Glen Road Exit, in Yucaipa. Click here for a map and directions. Christmas Tree Season November 27 to December 21, 2015. Payment: Cash, Debit cards, Visa/MasterCard. Click here for our Facebook page. We also have Indian Corn, Broom Corn and hard gourds for fall decorating. Family Fun Zone features over 20 attractions including an Archery Challenge, Rock Climbing Wall, and the Eurobungy. The Corn Maze is an all new Alien Adventure for 2015. Every night starting October 2nd, the Corn Maze lights up with thousands of colorful lights. Our Gift Shop houses Halloween and Thanksgiving items and a dazzling preview of Christmas Ornaments on display. The old west comes alive at our Cowboy Corner and two entertainment Stages. 39611 Oak Glen Road, Oak Glen, CA 92399. Phone: 909-797-1005. Fax: 909-797-2207. Email: [email protected]. Open: 7 Days a Week, 10 am to 5 pm. Berry Season Begins July and Ends in October. Apple Season Begins in August and Ends in November Raspberries: Late July through 1st frost Apples: August - November; Chestnuts: November - December Pears: August - September; Berries - Available from mid-August until the end of September. Pumpkins - Available from the end of September through the end of October. Directions: From the I-10 Freeway Exit Yucaipa Blvd and go north Make a Left onto Oak Glen Road Follow Oak Glen Road to Los Rios Rancho. Click here for a map and directions. We use natural practices, but are not yet certified Organic. Payment: Cash, Check, Visa/MasterCard, Discover. We value traditional farming methods and thus do not use pesticides or harmful chemicals on our produce. We are home to 8,000+ heirloom fruit trees and proudly produce 32 different unique apple varieties. We find that quality fruit tastes best when it is consumed as closely to it's picking season as possible. 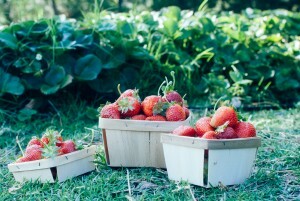 Berries: During the summer we offer over 3 acres of farm fresh raspberries and strawberries for U-pick. Pumpkins - Farm grown pumpkins are available for picking October and November. Supper Shows and Hoedowns Apple Butter Hoedown Currier and Ives Christmas Dinner and Dance Chuckwagon Supper Shows. Picking: Apples mid-August until they are picked out (call! ); Berries - Available from mid-August until the end of September and Pumpkins - Available from the end of September through the end of October; U-Press Cider 12-4, (7 days a week). And, on weekends only: Horse-drawn Hayrides from 11-4, Little Seedling Ranch from 11 -4, Large cider press in operation from 11 - 2 and Packing House Tours at 1:00 pm. They have an annual Thanksgiving weekend Apple Butter Festival celebrates this fine old tradition, and we invite families to come up and share in it. We'll have a hands-on demonstration of apple butter making the old-time (and slow!) way - outdoors in a big copper kettle; plus many more activities. There are restrooms, picnic, hiking, take credit cards, offer tours to groups, cider pressing, hay rides, petting zoo, and a great barbeque and gift shop. Also offer up public dinners with a live band that plays bluegrass. Comments from a visitor on October 05, 2009: "I love this place. I am addicted to it. I have to go back every fall." 12261 S. Oak Glen Road, Oak Glen, CA 92399. Phone: 909-797-7534. Fax: 909-790-2552. Email: [email protected]. Open: Monday to Saturday 10 am to 5 PM. Directions: Click here for a map and directions. Crops are usually available in May, June, July, August, September, October, November. Payment: Cash, Check, Visa/MasterCard, Discover, AmEx. Living History, Revolutionary War and Civil War field trips, Banquets, Dances, General Store. The cherries are at a different location/entrance; see this page. Riley's Farm is a working apple orchard and living history farm featuring pick-your-own fruit, living history education, dinner theatre, group banquet facilities and extended, historically-themed overnight stays. And if you're a teacher or a youth group leader, we have educational day trips of all sorts to meet your needs. 11124 Monte Vista Road, Phelan, CA 92371. Phone: 760 868-6826. Email: [email protected]. Open: Please call to make arrangements, Closed Saturday morning; We CAN be open from dawn to dusk just let us know when you want to come. Directions: One block west of Johnson Road between Goss and Rancho. Click here for a map and directions. Crops are usually available in June, July, August, September, October. Cherries are usually ready by the first week in June; Asian Pears are usually available in September. We use natural practices, but are not seeking organic certification. Payment: Cash, only. 39400 Oak Glen Road, Oak Glen, CA 92399. Phone: 909 797-3415. Fax: 909 797-3485. Email: Scott: [email protected]. Open: 9:00 to 5:00 seven days a week mid - August to December; August for great raspberry picking, open again for apples on September 1st; Apple season is September-November. Directions: From Palm Springs area, West on I-10. Exit Beaumont Avenue, go North about 9 miles. From LA area, East on I-10, exit Oak Glen Road, turn left on Oak Glen Road. Go about 5 miles. From Riverside & Orange County 91 Freeway to 60 Freeway, exit Beaumont Ave. Go North about 9 miles. Snow Line is about one mile East of Oak Glen Village. We use natural practices, but are not seeking organic certification. Payment: Cash, Check, Debit cards, Visa/MasterCard. Usually new berries ripen by Thursday and Friday. Our raspberries only come around once a year and the picking season varies based on weather, so please continue to follow us on Facebook for updates and availability. We carry a broad selection of products; fresh apples and cider, u-pick raspberries, cider mini donuts, artisan balsamics and oils, local honey, unique gifts, and farm made wine and hard cider. Comments from a visitor on August 14, 2010: "LOVE it so awesome! Nice quaint farm they have a nice antique shop in back as well as the best Cider Doughnuts "
1545 E. San Bernardino Ave, Redlands, CA 92373. Phone: 909-809-7537. Email: [email protected]. Open: U-Pick blueberries soon, just check our facebook page and we will let everyone know the dates; daily, from 10 am to 6 pm. Directions: We are located on the corner of San Bernardino Ave and Dearborn. Payment: Cash, only. Our main specialty is in honey bees, including pollination, honey production, beeswax and pollen. The main product we produce is RAW local honey. At our farm you can find farm fresh eggs and many different seasonal fruit and vegetables such as avocados, oranges, blueberries, squash, pumpkins, and many others. We try to produce quality products to make all of our customers Soffel Farm customers for life. We now have oranges, avocados, lemons, and pomelo grapefruit that are all picked fresh daily! Click here for our facebook page. 31 Hill Ranch Road, Angelus Oaks, CA 92870. Phone: 909-389-9410. Email: [email protected]. Open: We usually open for the season mid- September; check our website then. Directions: none. Click here for a map and directions. none. Payment: Cash, only. We hope to see you this Fall. Willowbrook Apple Farm - Pick your own Apples, Press your own cider. 12099 S. Oak Glen Road, Oak Glen, CA, 92399. Phone: 909-797-9484. Email: [email protected]. Open: Weekends October to November 12 10 am until dusk. 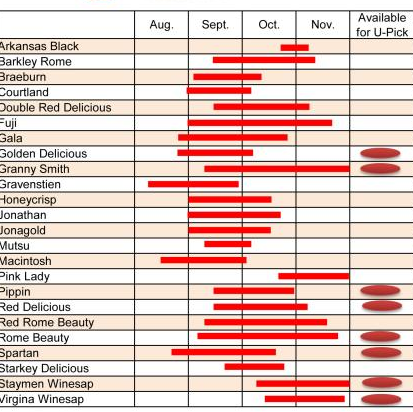 Call for weekday morning picking. Sample apple butter. Enjoy a fresh dipped caramel apple. Browse fall home accents. Pet horse and chickens. Directions: Exit 10 Freeway at Live Oak/Oak Glen Road in Yucaipa. Head north on Oak Glen Road for 12 miles. Stayman Winesap Apples.